Two front pockets and a large cooling compartment provide ample storage space for your food, snacks and drinks, while a full picnic set is included in its compartment. Includes 1x chopping board, 1x bottle opener, 4x dinner plates, 4x wine glasses, 4x napkins, 4x knives / forks / spoons, 1x salt and pepper shaker set and 1x small container for butter or condiments. A fully detachable bottle holder / cooler is also included, along with a large 115cm x 135cm tartan picnic blanket with waterproof base. Dimensions: 430mm Height ¦ 500mm Width ¦ 220mm Depth. 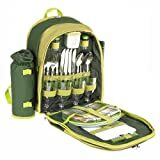 Top quality, four person picnic haversack from Savisto; enjoy a perfect day out with your other half, friends or family with this all-in-one picnic set, containing everything you need for a lovely outdoor lunch including a full cutlery set, plates, glasses, accessories and of course, a large mat. Remove the hassle of carrying a bulky picnic basket or hamper and instead enjoy the comfort and ease of this designer two strap, padded backpack from Savisto; perfect for days out at the beach, hiking or camping. Made from top quality 600 x 300D polyester, this luxury holdall features two ergonomic padded straps with a mesh backing for extra comfort on long journeys. In addition; the reusable dinnerware, crockery and utensils are all made from easy to clean materials to ensure a hassle free experience while you are out on your travels.